Pomegranates are in season now which means I am eating them as much as I possibly can. They are full of antioxidants, vitamin C and fiber. They also happen to be delicious. 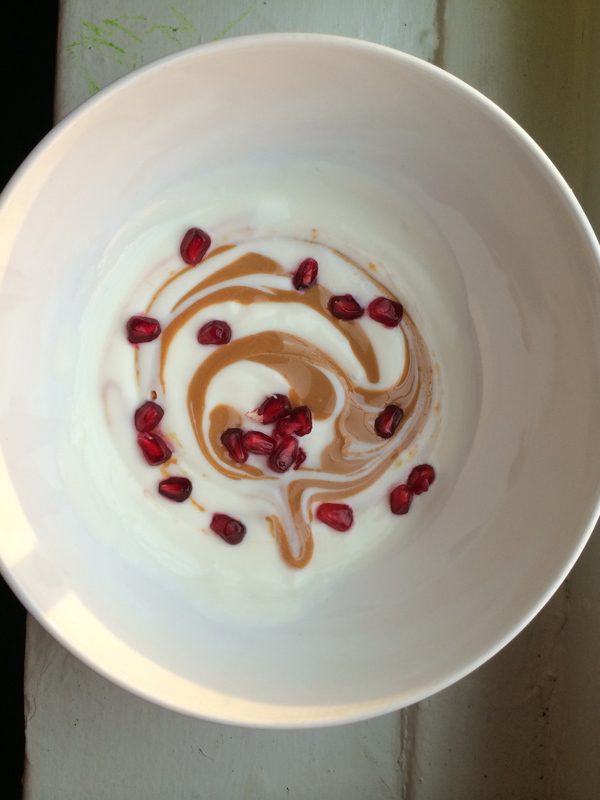 One of our favorite easy things to eat these days is take some yoghurt, stir in a hefty scoop of peanut butter and top it with Pomegranate seeds. My sister-in-law who is a Registered Dietician would put a scoop of peanut butter in her morning yoghurt to boost the protein content and stay full until lunch. I tried it once and was hooked. Peanut Butter lends an amazing richness to the creamy yoghurt that I just love. Pomegranates are the perfect complement and add a burst of sweetness, acidity and crunch. My 4-year-old is skeptical of the seeds so I stir them in well so she doesn’t see them. My 2-year-old gobbles it up any way and asks for more. You can use any full, non or low-fat plain yogurt but I prefer Greek because of the thicker texture and tangier flavor. It’s so good we’ve been known to eat this for dessert! You’ve got our household hooked as well! We’ve tried using crunchy almond butter as well and it’s also really tasty.